It's a triple threat of magic! Click here to play! Get yourself down to this wild slot today for some incredibly magical cash jackpots! 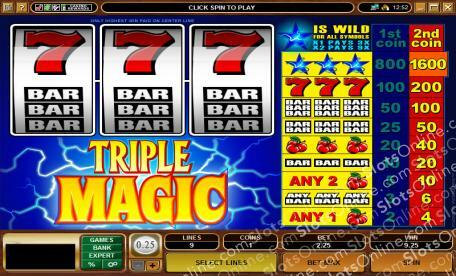 Triple Magic is a traditional 3-reel slot played across a single pay line with two coin slots. Wagering with a single coin will still earn you payouts, but if you play both you will double your cash every time you spin up a winning combination! The Electric Star is Wild and can be substituted for any other symbol on the reels in a winning combo. However, if you manage to spin up all three Electric Stars on the single pay line you will be rewarded with up to 1600 times your initial stake. Cherries, Bars, and 7s are always your friend, with excessive winnings on offer for any three-of-a-kinds. Dust off the old cape and wand, and get down to this slot today for some incredible cash payouts! The Electric Star is Wild and can be substituted for any other symbol on the reels. Spin up all three and you will find yourself with up to 1600 times your bet in winnings. Microgaming slots give you the option of several numbers of auto play spins including 5, 10, 25, 50, 100, 250, and 500. It provides a delay between each spin between 0.25 and 2 seconds, giving you time to see exactly how much money you win each spin. Microgaming also gives you the ability to stop your auto spins when a jackpot is won, a single win exceeds a dollar amount, any win, an increase or decrease by a predefined amount or simply, when the number of spins are complete.